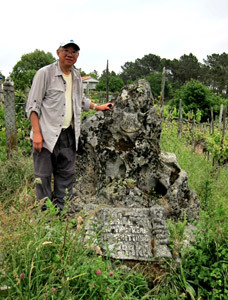 Gus Wong from Canada is currently walking the Camino de Santiago, along the Via de la Plata, starting in the city of Ourense. This is Gus’ second time walking the Camino with CaminoWays.com and here he shares his impressions and highlights on his new route to Santiago, thanks for sharing, Gus! Even though I am an unbeliever now, I still remember that from my Catholic school days. 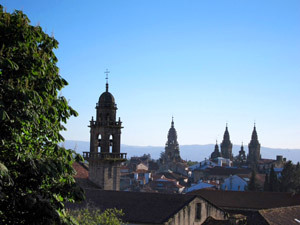 I flew Vueling from Barcelona and arrived in Santiago de Compostela in the afternoon. My luggage did not. So, no fresh socks. No change of underwear. No toothbrush. That’s not a good start to an adventure. But it’s really odd to arrive at the destination, the cathedral of St. James, only to be bused the next day 100 km away to walk to The Destination again. So do I visit the cathedral and say, I am here? I went into the cathedral and remembered not to get too excited yet. 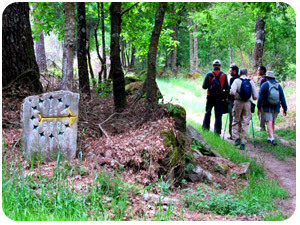 CaminoWays.com followed up on the case of the lost luggage, e-mailed to say it would be delivered to the hotel in Ourense the next day.St. James cathedral from a distance in the early evening hours. John, Ken, Larry, Eric and myself in Santiago. That makes five of us, so far. All nine hiker friends from Canada met, some for the first time, at a dinner in Ourense, hosted by Iago, representing CaminoWays.com. I know Iago from a cultural coach tour of the French Way from St. Jean Pied de Porte to Santiago, which he guided and I organized for a group of 14 alumni friends from Hong Kong last spring. Iago’s full name is Iago Ben Othello. (He is the second person I know by that name. First is the villain in Shakespeare’s play Othello.) Iago is Galician and is brimming in local knowledge. Before dinner, some friends went for a soak in the hot springs Ourense is famous for since Roman times. 11.30 p.m. No luggage delivery yet. T-shirt and dental floss courtesy of John, toothbrush and tooth paste courtesy of Stuart. We crossed a Roman bridge to leave Ourense. 12 km of steep climb over asphalt, then mostly country paths. Much like our Thursday hikes, only much longer. At 99 km to Santiago. Nearing Cea. We are staying in a beautiful country inn. Old granite houses almost 200 years old. Charming host and hostess feasted us. Still waiting to be re-united with my luggage. 8.30 a.m We started walking. Fresh polo shirt courtesy of John, thick socks courtesy of Jason. Wonderful friends I have. They all lent me or offered to lend me things I was going to need for the 6-day Camino walk. Great company to hike with too. Not counting Iago our guide, we are nine. Some of these friends I’ve come to know quite well since I joined them hiking about two years ago. For me, regular Thursday B-Team hikes. Those guys are Saturday A-Team. But all fair-weather hikers. (Wet Vancouver winters tend to cancel out Thursdays and Saturdays.) Two of the friends I only met twice before we gathered last week in Santiago. Now we are all having great hiking fun, in Galicia, eh! Monastery founded in 12 c., now inhabited by 12 Cistercian monks. Awe inspiring Gothic church. At the main altar, granite statute of Mother Mary breast feeding her child. Less elevation to overcome in the afternoon hike. 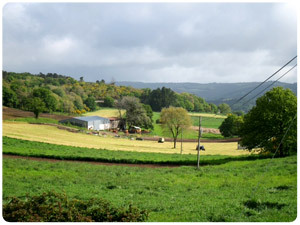 Gently rolling landscape, woods, farmland, occasional villages. Didn’t meet any other pilgrim on our way until we reached Dozon. Two of them, in a cafe. 8 p.m. Re-union with my luggage. 77 hours after my Vueling flight landed in Santiago last Friday. Now a happier man. I even got toasted at dinner in our fabulous country inn. Same time last year I was walking the last 100 km of the French Way in a company of 14, one of them my high school classmate, now a Jesuit priest. 13 friends trekking by the fields, asking: Master, is there life after death? Well, more along the line of questioning the church’s position on various social issues. 12 months later. Via de la Plata. Similar scenery. Secular conversations. Persistent rain from start to finish. We are from Vancouver, rain city of the Pacific Northeast. 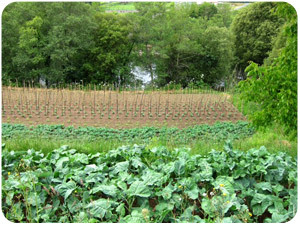 For us, Galician rain country is only a change of scenery. Highlights of the day: an old Roman bridge, lunch! and dinner! 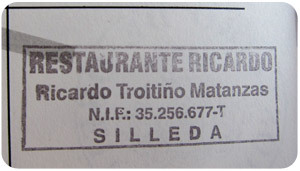 at Restaurante Ricardo, Silleda. Radio Salil – alivia rapidamente los dolores musculares y articulates, highly recommended by Iago our guide. We will all reek peppermint fresh at dinner tomorrow. A long easy hike today. Santiago tomorrow, and the hike ends. 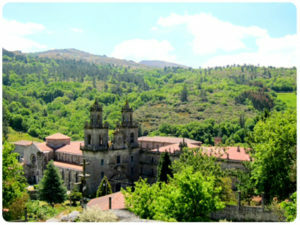 Arrival in Santiago, 4 p.m.
*Would you like to share your Camino de Santiago experience with CaminoWays.com? 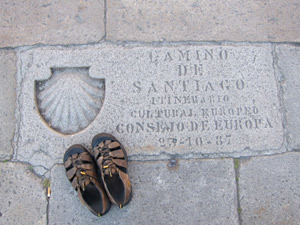 We’d love to read your Camino stories and publish them on our blog, get in touch with maria@caminoways.com. My first walk on the Camino (last 100 km, French Way) was with 13 Catholic alumni from university, one of them a priest who celebrated mass with us every morning in his hotel room. The walk turned out to be truly a pilgrimage that was also a retreat. And, a renewal of friendship dating back over 40 years. This year I was with a group of hikers. The idea of hiking day on day for a week brought us to the Camino. I found the 100 km walk through Galician country to be a beautiful pocket in space and time for us to walk in alternating company and solitude. This is what I learned from my repeat experience on the Camino. I saw in the Pilgrims Office a poster with a huge slogan: “Without the Cathedral, there will be no St. James’ Way”. I think, the Cathedral is great. But with or without the Cathedral, there is always St. James’ Way. As regular hikers, we were resonably prepared for the physical demands of the hike. As for things to bring, I cannot overemphasize the need for thick socks, good hiking boots, rain gear, a hat and sunblock. You may find trekking pole(s) helpful. For three days, my luggage was collecting a lot of air miles to join me. My friends provided me with the other essentials. When are you going, Enzo? We were a group of 9 men and Gus Wong coordinated the trip with you. We had a great experience and everything went very smoothly thanks to your local guide and representative Iago. Iago was extremely pleasant and friendly and so very efficient. His local knowledge of Galicia was invaluable. We could not have asked for a better guide. Please convey our congratulations and thanks to Iago. Thanks for writing this Gus. I’m very envious of your experience on El Camino and am anxious to have my own experience, hopefully this year if all goes well. I’d like to ask what your purpose was for going on this walk and what you got out of it? Also, what’s your best advice for preparing for this walk e.g. physical preparation, things to bring or not bring, etc. I appreciate any feedback you’d be willing to provide.